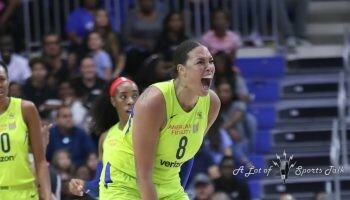 WHITE PLAINS, NY — The New York Liberty were already in massive amounts of trouble the second after Washington Mystics star Elena Delle Donne was done wrapping up an uncharacteristically poor performance in her last game on Thursday. 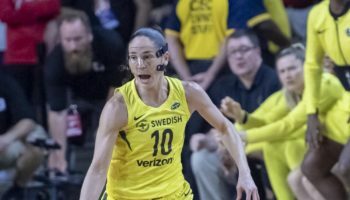 The five-time All-Star has followed off shooting nights this season with virtuoso performances in the next outing, and Delle Donne once again bounced back in grand fashion on Saturday. 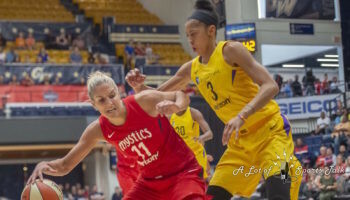 Making her first six shots from the field, Delle Donne paced the Mystics with 30 points and 10 rebounds as Washington defeated the Liberty 95-78 at the Westchester County Center, helping to stop a slide which had seen the Mystics lose four of their last five contests before today. 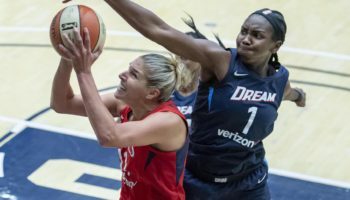 Delle Donne came to the Empire State after a 3-for-14 shooting performance – her worst game of the season in terms of field goal percentage – in a loss to the Dallas Wings on Thursday, scoring just nine points in the process. The last time Delle Donne scored fewer than 10 points in a game, an eight-point effort against Minnesota on June 7, she followed that with a season-high 36 points in a win at Connecticut in a nationally-televised game. Earlier this month, Delle Donne scored 29 points in Seattle one day after being held to just 11 on the road against Los Angeles on July 7. At the end of the first quarter against the Liberty, Delle Donne had already surpassed her point total from Thursday with 15 points, making all six of her shots in the quarter – three of them from beyond the arc. 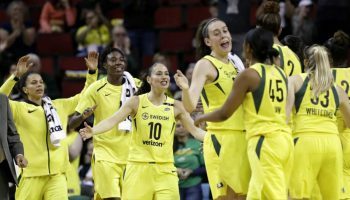 New York, spurred on by its bench, had cut Washington’s once 12-point first-quarter to 24-23 early in the second quarter on a layup by forward Amanda Zahui B. But that was as close as New York came from retaking the lead in the game as the Mystics, not too long after Delle Donne re-entered the game after playing all 10 minutes in the first quarter and getting a rest to start the second, responded with a 12-2 run to regain control of the game at 36-25. Outside of two Delle Donne free throws, 10 of the 12 points came from reserves Shatori Walker-Kimbrough and Tierra Ruffin-Pratt. Washington (14-10) entered the half leading by eight, 43-35, but then put its foot on the gas in the third quarter to put the game on ice, outscoring the Liberty 32-18 in the quarter. The Mystics opened up a lead of 22 on a couple of occasions late in the quarter, including after a Delle Donne jumper with 30 seconds remaining for a 73-51 advantage. The Mystics were executing their halftime strategy perfectly and spreading the floor, making 12 of their 16 attempts from the field in the third quarter. “We talked about at halftime the first three or four possessions we needed at both ends of the floor. Execute the offense to see if we can get Elena some easy touches and we did,” Mystics head coach Mike Thibault said. Those touches by Delle Donne helped to open up the offense for the rest of the players on the floor throughout the game. Guard Kristi Toliver ended up with 19 points while Ruffin-Pratt had 12. Walker-Kimbrough and Ariel Atkins each had 10 points. In defeat, the Liberty were led by forward Tina Charles with 22 points. Guard Sugar Rodgers had 16 points while Kia Nurse had 10 points off the bench. The Mystics play the fourth game of their current five-game road trip in Connecticut next Tuesday before ending the trip, after the All-Star Break, in Atlanta against the Dream on July 31. New York (7-17) has now lost 11 of their last 14 games and will play in Minnesota against the defending champion Lynx before the break.